Properties in Maison Louis XIV average 4.5 out of 5 stars. 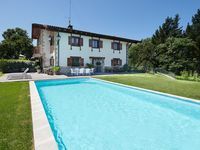 Property 64: villa with large garden terrace. 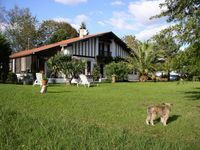 Villa sleeps 12, quiet area of St Jean De Luz, facing the Rhune. Property 77: Villa sleeps 12, quiet area of St Jean De Luz, facing the Rhune. We were two families with 5 kids meeting for a long weekend to explore the Basque coast. The property was perfect for our large group. The house is very clean and well equipped with everything that we needed. The views of the town below and France are truly spectacular. We enjoyed spectacular sunrises. The kids enjoued the pool while the adults sipped coffee on the large terrace. We were planning on spending most of our time in San Sebastian (About a 25 minute drive from the house) but found that we were drawn to the beaches and old town of Hondarribia. We all agreed that we needed more than a weekend to explore the area. Jose was an excellent host. He welcomed us with a few nice local snacks, gave us restaurant suggestions, and made sure we got to the supermarket before it closed. We didn&rsquo;t hear from him the rest of the weekend until it was time to leave and he showed up at the door to check us out. The house does share a wall with the neighbor but we had no noise issues. We were a bit confused when we arrived as there are two driveways so know that it&rsquo;s the house and path on the left. An excellent accommodation for our large group. Spent a week in mid-April 2018, and enjoyed stellar weather conditions. This roomy and peaceful house stands on top of a hill with an embracing view of Hasparren. The nearby birds and grazing sheep are the only noise pollution you will hear on your stay. The aperitif are taken at sunset with a choice of two patios (indoor or outdoor). You can make the market in nearby Bayonne in 20 minutes and be back early enough to prepare lunch. The kitchen equipment and facilities are somewhat limiting. The owners, Lionel and Catherine were discrete and very helpful. Yes, we would definitely comeback for another stay.